The Use of English as the Sole Medium of Instructions in Philippine Schools: We are hoping for your support. Recently, the lower house of the Philippine Senate has approved making English the SOLE medium of instruction in Philippine Schools. If you believe in the Filipino language as an important link to our identity and culture, please sign this petition and share it ASAP! As Filipinos abroad, our perspectives are very valuable regarding current issues in the Philippines. Our goal is to finish this by December 29, 2006. Please forward this to all of your family, friends, and any other allies of the Filipino community. Thank you for your support! Is the fast slipping mastery of English language a grave threat in our economy? Is the proposed law by some legislators designating Filipino, the national language, as the sole medium of instruction in school, not realistic? Or has it affected the decline of English teaching through the years? After the recent remark made by the US ambassador Francis J. Ricciardone about the Filipinos’ incapability of English usage, many scholars reacted, and have started to raise questions if we really are literate enough when it comes to oral and written English communication. The U.S. ambassador has urged the government to improve English Education in the country or lose foreign investment to other countries. Professor Jose Wendell Capili, a former Associate Dean of UP College of Arts and Letters (CAL) and currently a Ph.D. candidate at The Research School of Pacific and Asian Studies of Australian National University agreed with Ricciardone’s observation. “I think U.S. Ambassador Ricciardone has articulated what has been happening all along. While I maintain that Filipinos do have a higher functional command of the English language compared to most of our Asian neighbors, we are slowly losing our competitive edge, because our political leaders are less concerned about investing in good teachers especially in the primary and secondary level,” he explained. Michael Andrada, another professor from UP Departmento ng Filipino at Panitikan ng Pilipinas (DFPP), said that Ricciardone’s concept of development is tied in the proficient use of English. He views the Ambassador’s effort to urge the government to improve the country’s English literacy as a way of reinforcing English as the global language. However, he thinks that the problem is not in the language itself but in the ideology the language has. “Implementing Filipino is still problematic because it’s not yet systematized and homogenized. The more if we promote English which is complicated to learn,” Andrada explained. Meanwhile, Virgilio Almario, dean of UP College of Arts and Letters (CAL), thinks that it is natural for the U.S. ambassador to make such comments and actions. “He’s a good Ambassador and should be lauded by their president. As the Ambassador of U.S, it is his duty to promote the interest of the Americans, and the propagation of the English language is one way to do that,” he added. In the recent statements made by Ricciardone, he also said that the legislators’ proposal of a law to designate Filipino as the medium of instruction in schools was “not realistic,”citing the difficulty of foreign companies as outsourcing firms to hire good English speaking Filipinos. DECLINE IN ENGLISH PROFICIENCY MEANS LOSS OF FOREIGN INVESTMENTS? All three academicians agreed that the rise of outsourcing companies is not the answer to the country’s problems. Andrada believes that the boom of call centers in the country is an upsurge of a neo-colonial system as a way to eradicate the Filipino language. Capili believes that globalization is important, but Filipinos should know which aspects of globalization should be embraced and which ones should not. He said a policy shouldn’t be blindly and wholeheartedly accepted simply because a powerful nation like the United States insists about accepting it. EDUCATE FILIPINOS IN ENGLISH OR EDUCATE PER SE? Ricciardone warned that the mastery of the language was fast slipping and that the government must invest more in educating Filipinos in English. “English teaching in the Philippines has declined in the last 15 to 20 years,” he noted. He also suggested that graduates of top educational institutions should be required to teach in a grade school or high school from the region where they came from (for at least six months to one year) before they embark on other career choices. “This is in fact a worthier substitute to ROTC. We need good teachers in the primary and secondary school systems. Our college students are not competitive compared with the rest of the world because the basic things had not been mastered,” he pointed out. Sarah Perez, an artist in Chicago, created a piece designed by Tatak Ng Apat Na Alon Tribe for an art group called ” You Are Beautiful.” In their recent project, all different artists have been assigned different letters to design/decorate that, when put together, will spell out the phrase ” You are Beautiful” in different languages. These pieces will be displayed outside, along the streets of Chicago. Special thanks to Sarah Perez for the beautiful job that she did on the M. [1 & 2] Finished product by Sarah Perez Bernard Runo (Amang-RED), leader of Chicago Chapter, and Maia Young (Anak), midwest member. FILIPINO 100TH ANNIVERSARY CELEBRATION! On Friday, October 27, 6 p.m. at Cardinal Stritch University, Hale O Malo will perform 2 shows filled with new dances and costumes in honor of the 100th Anniversary of the Filipino community settling in the Hawai’ian Islands. Tickets are $25 for the evening. Guests are encouraged to purchase tickets in advance from Daryl Krajecki, President of the Greater Milwaukee Filipino Club. Phone him at: 902-648-8353 or EM: dario326@yahoo.com. Proceeds from the evening will go toward the revitalization of the Asian Moon Festival and the preservation of the Asian Pacific community in Milwaukee. In addition, Halo O Malo will have a craft booth with some unique gift ideas. Come for a fun-filled evening to support the Asian Moon Festival and the Asian Pacific community in Milwaukee. Hope to see you all there! For more information on Hale O Malo, please visit www.hawaiian-dancers.com. In celebration of Filipino-American History month the Bay Area Chapter will be doing a lecture about Philippine history from 1587 up until today and also about Philippine Tattoo Traditions & Tatak Ng Apat Na Alon Tribe at UC DAVIS. California State University – Long Beach. In celebration of Pilipino-American Heritage Month Zheta Phi Ro invited Tatak Ng Apat Na Alon to do a special presentation about the revival of Pilipino Tattoo Traditions. 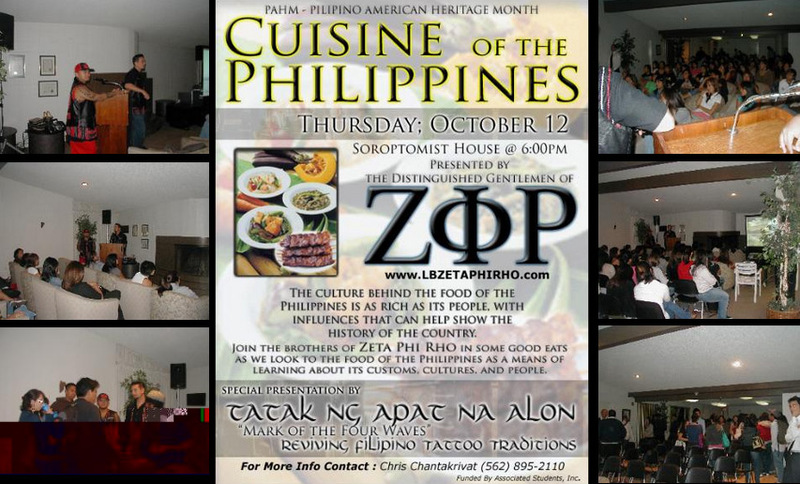 Other presentations included Cuisines of the Philippines held at the Soroptomist house @ 6:00pm. Special thanks to Zheta Phi Ro and everyone who attended the lecture for giving us the pleasure to spread the knowledge of our tattooed history. 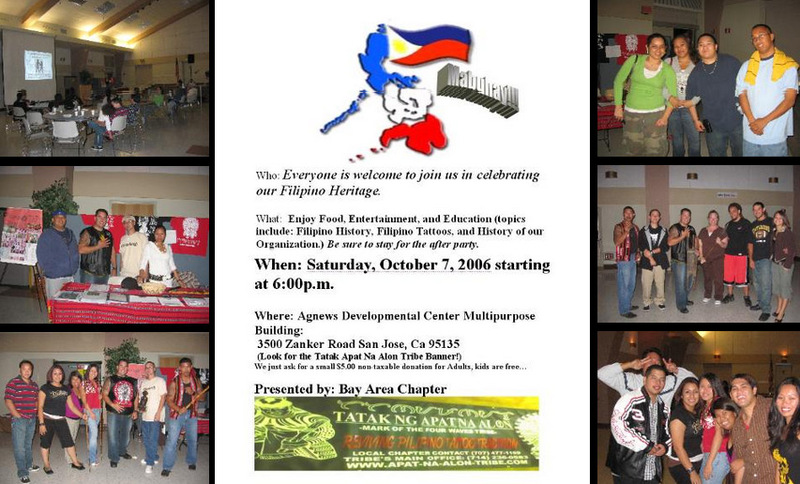 Bay Area Chapter hosted a meeting to celebrate our Filipino heritage with food, entertainment, and education (topics included: Filipino History, Filipino Tattoos, and the history of our Organization. The meeting was held at the Agnews Developmental Center Multipurpose Building: 3500 Zanker Rd., San Jose, CA 95135. Come and join TATAK NG APAT NA ALON TRIBE at the 15th Annual Festival of Philippine Arts and Culture at Pt. Fermin Park, San Pedro, CA. Admission is $3 per day at the Festival, but a two-day pass is $5 and available here! Since many people come the Festival with family and friends you can also purchase an FPAC 4Pack, a $20 value which includes 4 two-day passes comes with a free Banig (Filipino mat). Come for the whole day and enjoy a wide variety of food, clothing, artwork, books, and other memorabilia will be sold at the event. 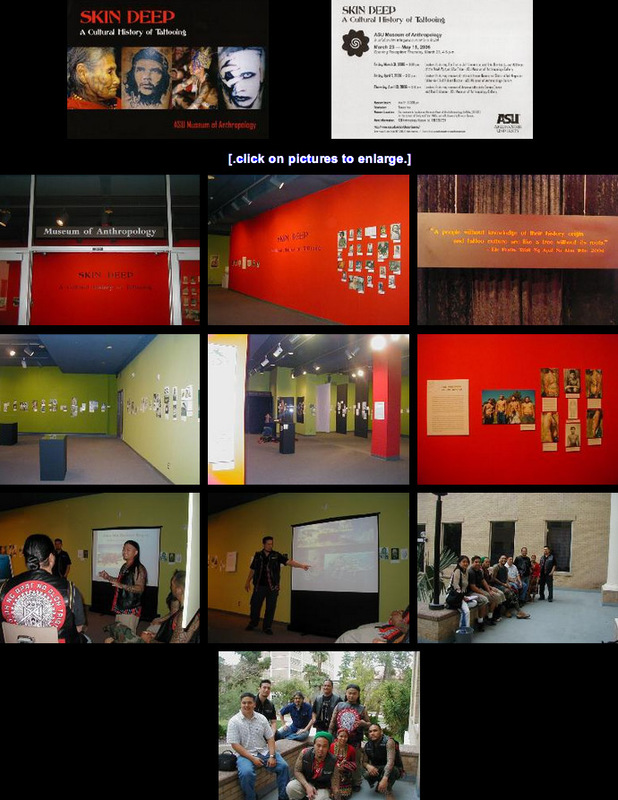 FPAC features a wide array of cultural and artistic showcases and activities. Tatak Ng Apat Na Alon will have a booth for anyone interested in tattoos or just inquiring some more information about the revival. Hope to see you there! The night of September 9th the Tribe had a ceremony to celebrate tribe member Jayson Winborn as he moves up in rank as Amang-RED. Oolah The Moc with Koko – 2006 West Coast Tour. Performed at the Temple Bar in Santa Monica, CA w/ Iration. Picture’s taken of Ooklah The Moc during their performance. Check out Jimbo (Amang). Another tattoo filled weekend with Aisea & Anu who came down from San Jose. Pictures below show Anu getting his face tattooed by Aisea and Eric Barrios ( Amang-RED) getting his left side of his chest done. Charphil (Anak-RED) from Florida Chapter got his leg tapped by Elle (Amang-RED) and Samoan Jay (Amang-RED) helped stretch. A tattoo filled weekend. Bill and Aisea doing Visayan tattoos. Seattle Tattoo Convention. Washington Chapter and Oahu Chapter members will be at the convention representing with San Jose friends from Humble Beginnings Tattoo Studio and friends from Hawaii, Aisea and Bong. Tickets 1 day pass $15 or 3 day pass $35. 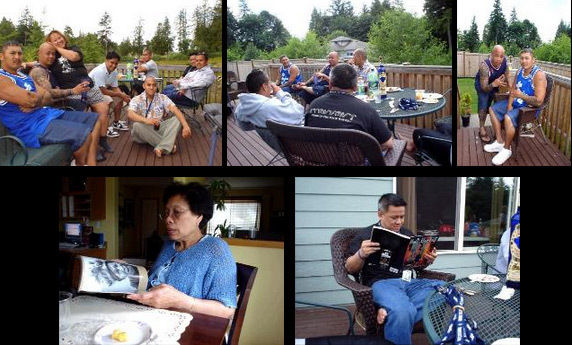 Tatak Ng Apat Na Alon Tribe Los Angeles and Chicago Chapter will be meeting up with tribe members of the Oahu and Big Island Chapter in Maui, HI to celebrate the leaders as they move up in rank as Amang and Inang’s. Tattoo. Yvette tattooing tribe member Jimbo (Amang)  Jimbo’s chaklag  Jimbo, Biggz, Lee, Eric, and Elle showing off their chest pieces. BELOW:  Nohea, Ras Bird (Amang), Lexy Girl  Bernard (Amang-RED) getting tattooed by Yvette  Bernard’s Chaklag  Eric Barrios (Amang-RED), Elle (Amang-RED), Biggz (Amang-RED), Bernard Runo (Amang-RED) and Lee Yarza (Amang-RED)  Kala, Charphil (Anak-RED), Gerardo, Lee, Nohea, Gyroe (Amang-RED) and Albert Soratorio @ Life’s A Beach  Charphil, Biggz, Nohea, Eric (in the back throwing the four), Lee (behind Nohea’s hand), Jacob De La Nux (Drummer/Singer @ Life’s A Beach), Monique, Annebell and Gerardo  Gyroe, Charphil, Tamika, Nohea, Eric, Albert @ Nohea’s Waiehu Hale garage. TATAK NG APAT NA ALON TRIBE WASHINGTON CHAPTER will have a booth for PISTA SA NAYON. intrested in joining or simply want to chat with the members. 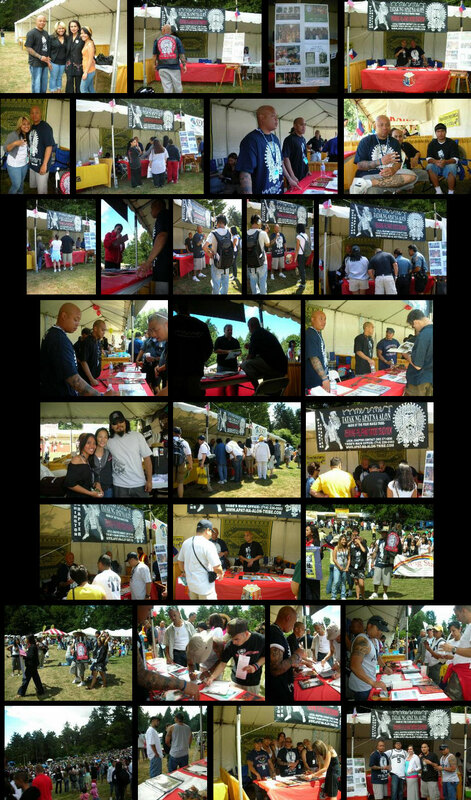 Join us in our efforts to revive our great filipino tattoo tradition. We are also trying to help our Pilipino youngsters back home by collecting and sending books through books for the barrios. Click on fliers to view information. 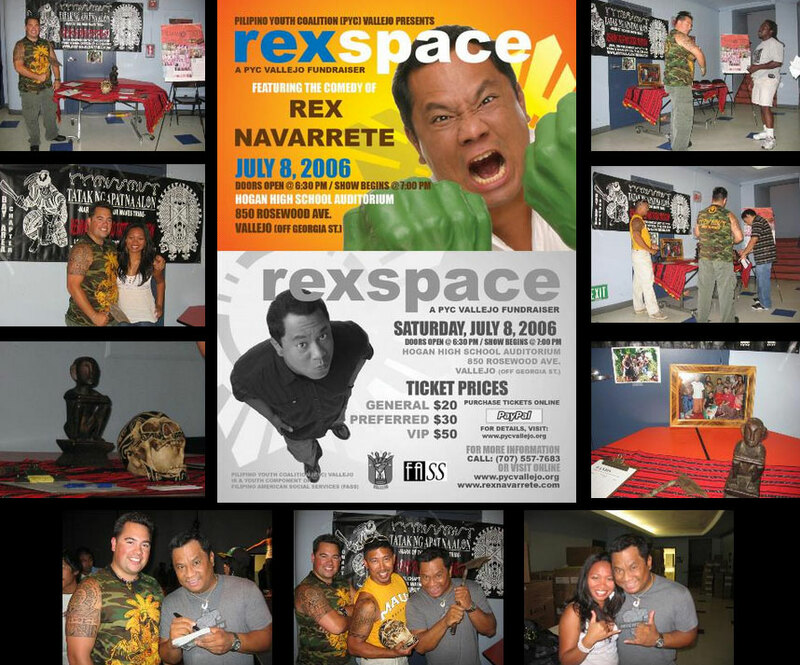 Pilipino Youth Coalition (PYC) Vallejo Presents: REXSPACE – A PYC Vallejo Fund raiser featuring the comedy of Rex Navarrete. Tatak Ng Apat Na Alon Tribe – Bay Area Chapter had a special table set up at this event to represent the tribe and gain more interest. A handful of people took the time to leave their info so we can contact them of future meetings. Pictures taken by Estherlyn (Duke’s wife). Jayson Winborn (Amang-BLACK) had a small meeting to celebrate his birthday as well as Father’s Day. They talked about some Fillipino history and plans for the Pista Sa Nayon Booth. View pictures below. Dennis, Jayson Winborn (Amang-BLACK), Maria (candidate), Pete (candidate), and Mikes Friend, Jayson’s stepson, Mel (candidate), Jayson’s Brother in Law and Mike Encoy(Amang-BLACK). Everyone discussing about history. Jayson and Dennis. Mel reading up on some info  Jayson’s mom reading up on The Last Filipino Headhunters. VALLEJO PISTA SA NAYON – A Filipino Cultural Celebration. Celebrate with Vallejo’s rich and diverse Filipino community as they commemorate the 20th year of celebrating Philippine cultural Month in Vallejo and the 100th anniversary of the first Filipino immigrants in America. 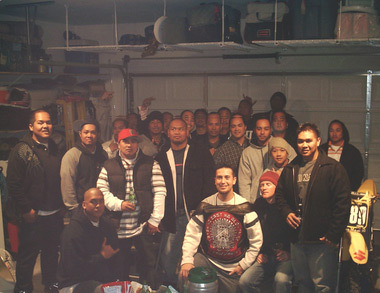 Tatak Ng Apat Na Alon Tribe – Bay Area Chapter representing to the fullest. From Mel (Amang-RED), Pedro (Anak), and Duke (Anak) spreading the news about the Tribe’s revival and mission, shown in the pictures below. Tatak Ng Apat Na Alon Tribe will have a booth featured in the festival along with food and other great vendors such as Island Tribe and Jenna’s Tropical Collection. Also an acoustic set by Local Culture. Doors open at 4pm. Show starts at 6pm. Bring your whole Family and your friends!!! The 14th Annual Hawaiian Telecom FILIPINO FIESTA & PARADE. The state’s largest Filipino community celebration includes food, entertainment and crafts from various regions of the Philippines that demonstrate the depth of the Filipino culture, and sustain the legacy and diversity of the community. An estimated 20,000 local residents and visitors are expected to participate in this year’s Fiesta. Community Center inWaipahu. Inaugurated on June 11, 2002,the FilCom was also the site of a week-long Fiesta in 2002. 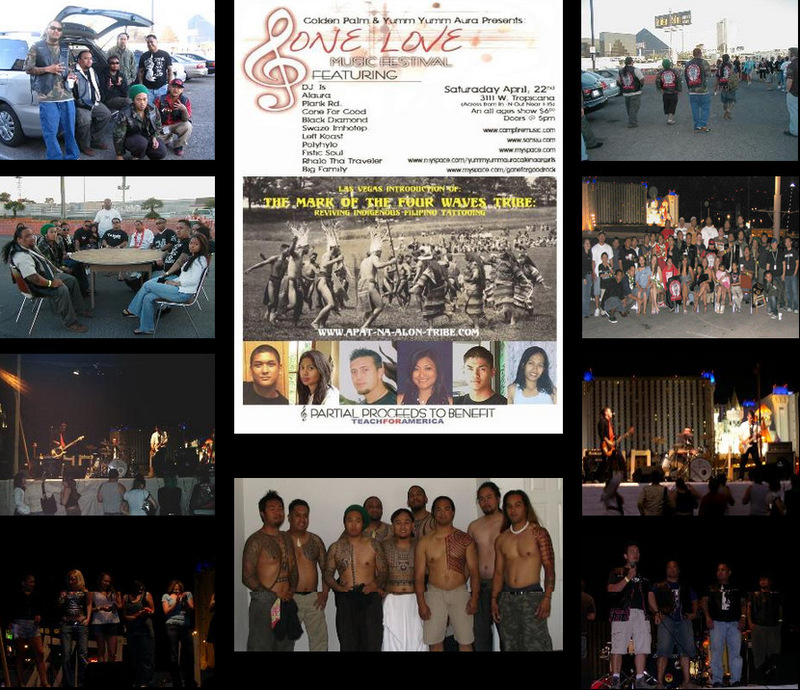 The Filipino Community Center’s mission is to develop, own and operate a community center that provides social, economic and educational services, and to promote and perpetuate the Filipino culture and customs in the State of Hawaii. The Filcom Center is the largest Filipino community center in the United States and outside of the Philippines. DANNU (a candidate to join the tribe). Las Vegas Chapter had a concert/mixer/fundraiser. They invited the Amang-Red’s from both LA and Chicago Chapter to meet prospecting candidates to join the tribe and witness how great of a job they are doing with their chapter and how they want to shape the Las Vegas Filipino Community. Partial proceeds to this event benefit towards Teach for America. This new exhibition will explore the tradition of indelible marking among indigenous peoples and other tattoo communities, past and present. Drawing from the accounts of explorers, historians and anthropologists, as well as the curator’s publications and field research, Skin Deep is a record of tattoo artistry and culture presented through interviews, objects, and many images from around the tattoo world dating from 5000 BCE to the present. The exhibit includes contemporary and historical photographs, rare books, engravings, postcards, tattoo instruments, documentary film and other visual media. Although the exhibition examines the history and cultural significance behind ancient and more modern forms of tattooing, it also attempts to establish new ways of seeing and reading the messages encoded in tattooing practices themselves. years recording the stories of tattooed people from around the globe. 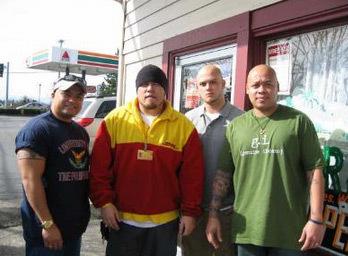 Washington Chapter, Jayson Winborn (Amang-BLACK) along with John and Pete, met up with a candidate to join the Tribe – Al Acosta. Al is in the army and has been researching the tattoo culture and history of the Philippines for a few years. He said he has an extensive library that deals with filipino history, he also goes back home to the Philippines and talks with a few professors from U.P. and other colleges. PASIFIKA 2006, Western Springs Park, Auckland. This was also my second visit to Auckland and its annual PASIFIKA festival celebrating the culture, food, art and music of the many Poylnesian nations that lie just to the east of Aotearoa. 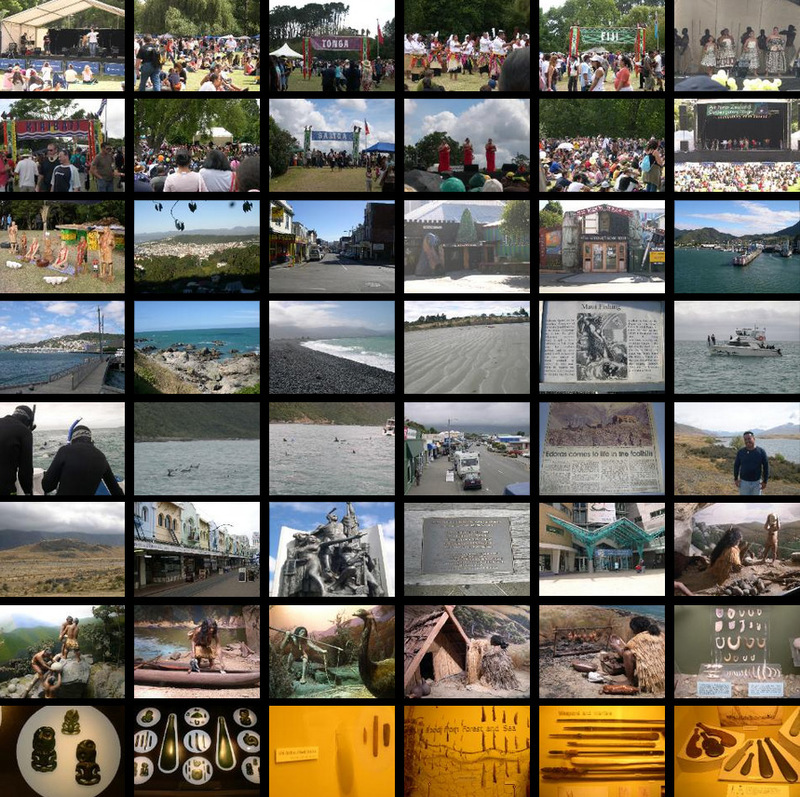 Auckland is the largest city in Polynesia and the over 250,000 that attended this year’s festival is just an indication of how large the Polynesian population actually is. The park was divided up in villages representing the island nations/kingdoms of Tonga, Niue, Kiribati, Samoa, Tuvalu, Fiji and the indigenous Maori of New Zealand. The villages featured the handicrafts, textiles, music, dancing and food particular to each country. Needless to say there were quite a few folks sporting native tattoos. This was also my first time to visit the South Island of New Zealand. Picturesque and naturally green and beautiful, I can see why Lord of the Rings was filmed here. I got to visit several sites where the movie was filmed, just up the road from my friend’s lake house. The Community of Baranggay Didipio, Kasibu Nueva Vizcaya filed a Petition for Mandamus against the Department of Environment and Natural Resources and Climax Arimco Mining Corporation (CAMC), and its transferee Australasian Philippines Mining Incorporated (APMI) to force the agency to cancel the environmental compliance certificate (ECC) issued to Climax Arimco/ Australasian Philippines Mining Inc. (CAMC/APMI) and prevent the implementation of an invalid Environmental Compliance Certificate (ECC). The Environmental Compliance Certificate and the Financial Technical Assistance Agreement (FTAA) issued to CAMC are conditioned on the local government consent requirement under sections 26 and 27 of the Republic Act 7160 or the Local Government Code of the Philippines. Under the law, CAMC/APMI should have obtained the consent of the Barangay, Municipal and Provincial councils as precondition to their mining operation. Both the Barangay and Municipal councils have already registered their opposition to the Didipio Gold/Copper mining project. “Accordingly, the failure to fulfill the local government consent requirement has rendered invalid the ECC of CAMC/APMI and therefore, any mining operation that will be commenced in the area will be illegal”, said Atty. Mary Ann Dela Pena –Regional Lawyer LRC-KSK/Friends of the Earth –Philippines. On August 8, 2005, the municipal council of Kasibu, Nueva Vizcaya, Philippines resolved NOT TO ENDORSE the Didipio Gold-Copper Mining Project of CAMC/APMI. Despite demands to DENR and its attached agencies to enforce the Ministerial cancellation of the ECC, no response has been given. Hence, a Petition for Mandamus is being filed to compel the DENR to issue a cancellation of the subject ECC. In line with this activity the Bishops of Northern Luzon led by Bishop Ramon Villena of Nueva Vizcaya and participated in by Bishop Sergio Utleg, of the Diocese of Ilagan, and Bishop Jun Andaya of the Diocese of Tabuk will be holding a thanksgiving mass at the Cathedral of Bayombong, Nueva Vizcaya to support the Didipio community’s campaign against Climax Arimco/Australasian Philippines Mining Inc. The thanksgiving mass will be attended by the members of the Didipio community together with the Municipal officials of Kasibu and other advocates against large scale corporate mining in Nueva Vizcaya. 87- Madasalin St. Teachers Village, Q.C. Bernard Runo Amang-RED of Chicago Chapter’s trip to Australia and New Zealand. This was my second time down under. It was great meeting kababayans over there, especially those interested in starting a chapter of the Tribe. I got to meet Shane Molomolo who is currently serving as an officer in the Australian Navy. He was excited to meet someone from the US Tribe and was just as taken aback by my American accent as I was with his Australian accent. We met both in Sydney and at this new post up north in Cairns, Queensland. This was my first visit to the tropical north, a region famous for the Great Barrier Reef, tropical rain forest, rivers and black crocodiles. I just missed the hurricane by a few days. Skin & Ink Tattoo Magazine, March 2006 Issue. 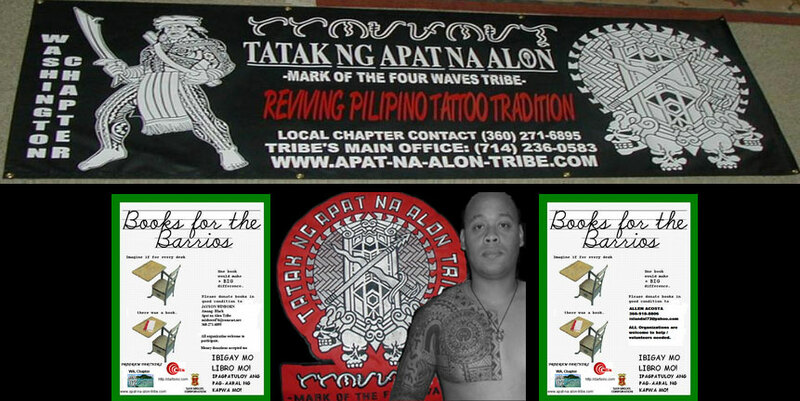 Features Tatak Ng Apat Na Alon Tribe in an article written by Lars Krutak called “Return of the Headhunters – The Philippine Tattoo Revival. To view the whole 8 page article, you’ll have to buy the magazine to check it out. In Stores Now. Skin & Ink Cover  Kalinga Warriors photographed at the Baguio Carnival and Exposition of 1949, featured on the right side is Lakay Ollasic, supporter of the tribes revival. 1st page of article on the Tribe. Ti Similla – Official Newsletter of the Academic Staff – UP Baguio: March 2006. One year after: latest news article on Philippine Central Cordillera Traverse Expedition on Page 7 and 8. Las Vegas Chapter had a gathering to talk about furthering the growth of their chapter. 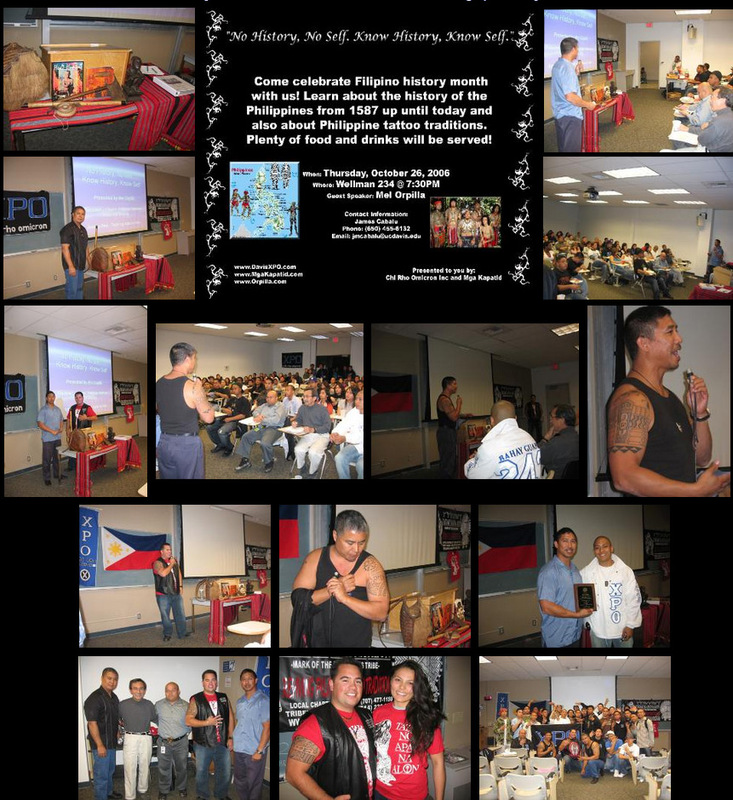 Members and candidates from the Las Vegas Chapter of the Tribe get together to discuss cultural pride, indigenous beliefs and the tattooing traditions of the Philippines. Afterwards the Las Vegas Chapter, along with Filipinos all across the globe, watched Manny Pacquiao defeat Eric Morales for the super-feather weight title! Filipino Pride soars around the world!!! 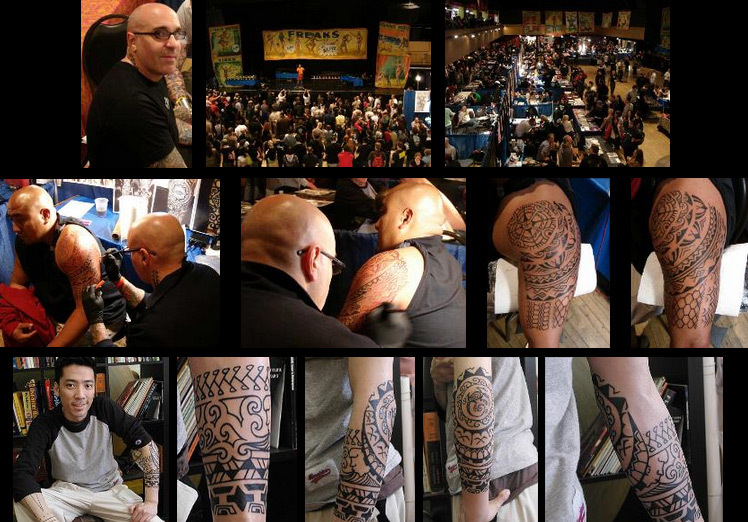 January 6-8, 2006 Body Art Expo – Tattoo and Body Art Convention at the Pomona Fairplex. Members of the Tribe entered the Tribal Contest along with friends of the Tribe Jackie, Jacinda, and Ati . The 1st and 3rd place were given to Ati and Jackie whose Samoan Tattoos were designed by Bill and Tattooed by BIG ROCK of The Speezy.